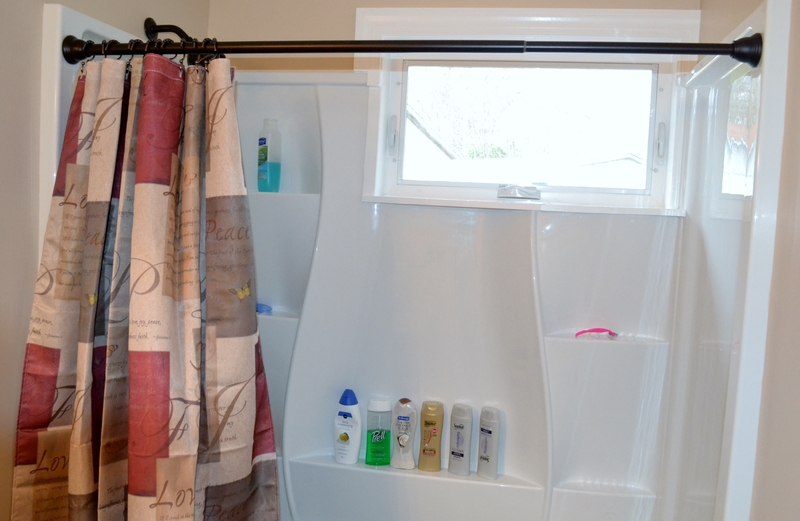 Some of the 10 Things Thankful crowd asked for before and after pictures of our recent bathroom renovations. 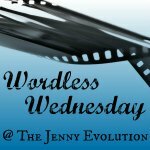 I shared pictures Sunday in this post. The before pictures were awful. We had already started tearing off the old wallpaper. I could no longer scrub clean our old cast iron tub. I scrubbed 30 minutes, and it still looked dirty. Plus, we had really bad sub-flooring and mold issues. 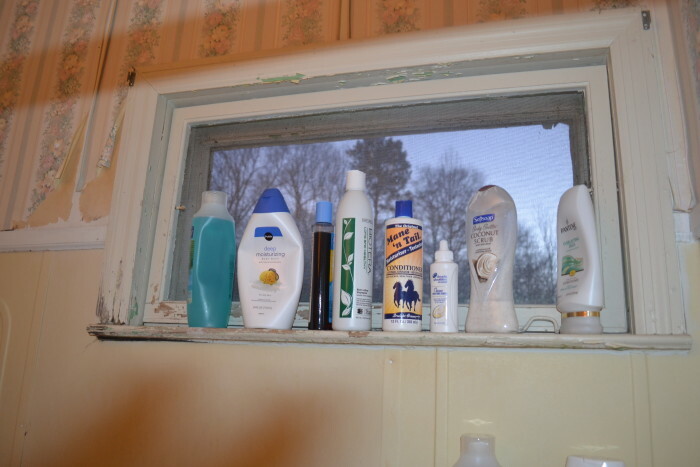 Our old bathrom window. Notice the peeling paint. 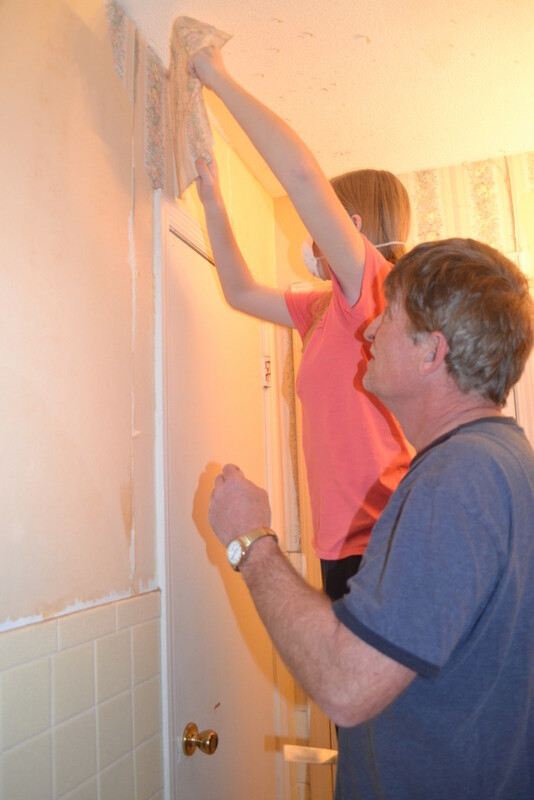 KR and hubby tear off the old wallpaper in preparation for the carpenter and plumbers. 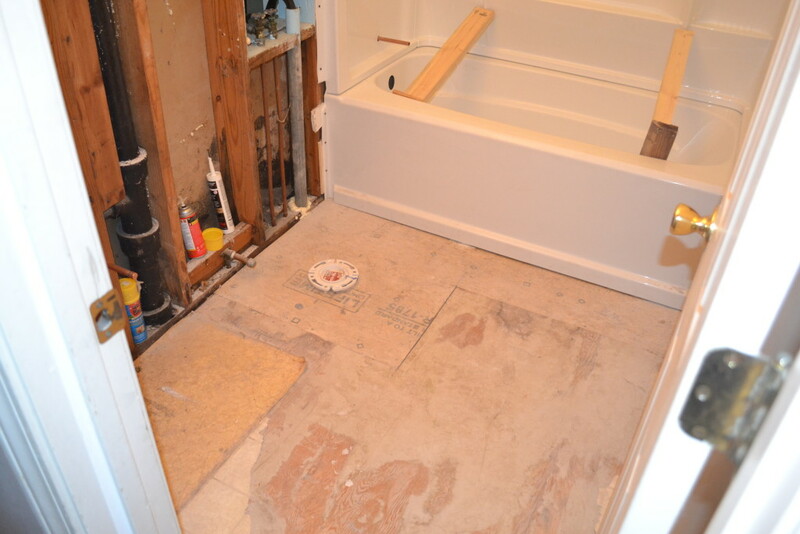 Thanks to local plumbing company and carpenter who did all the hard work! I just watched and swept up and dusted off the saw dust every evening that floated all over house, landing on floors and furniture. 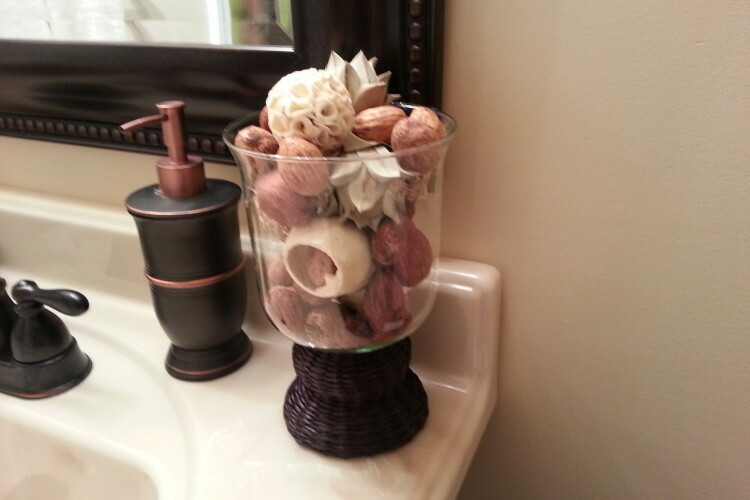 Other decorative touches include oil rubbed mirror and vanity light. 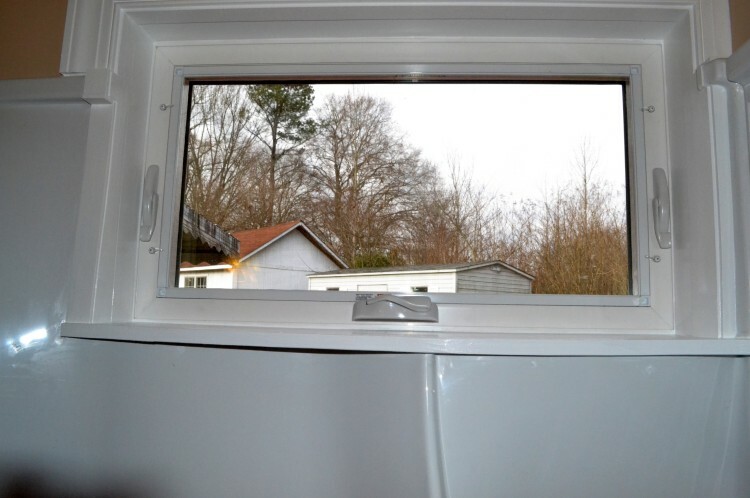 Beautiful natural light from our energy efficient bathroom window. 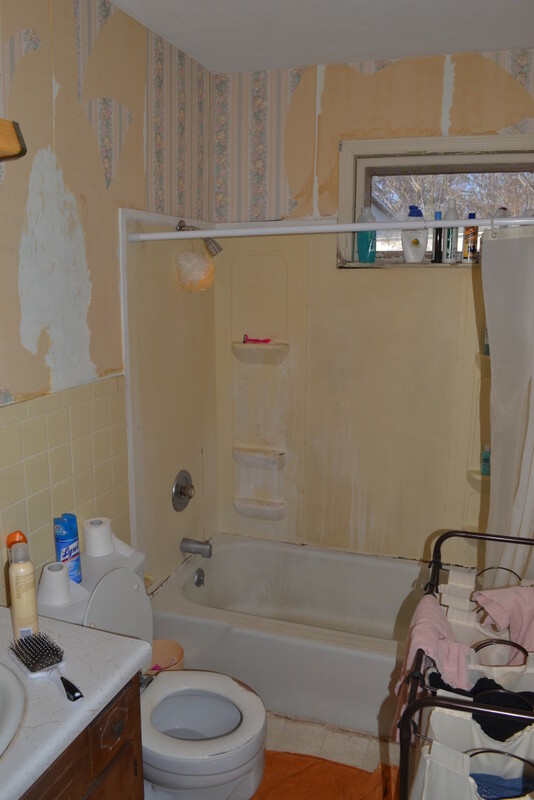 Best of luck on the reno after your bathroom. 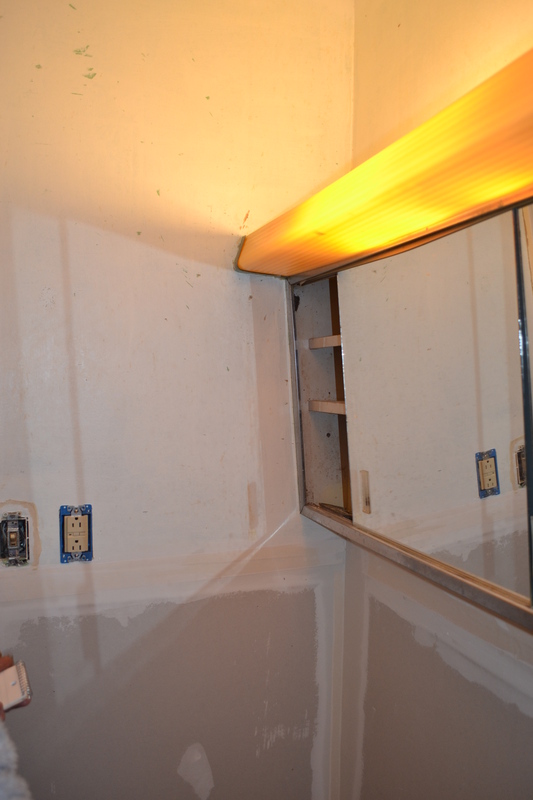 I had a home renovation done about 1+ years ago and it did not go well as I had expected. Very nice job!! I like everything about it. Hi Mary, congrats on your post. The bathroom looks amazing. I love the colour you have chose for the faucet, mirror frame, towel hanger bar, toilet roll … make it look very fresh and modern. Thanks for your comment. The bathroom still looks great. I am proud of the results. 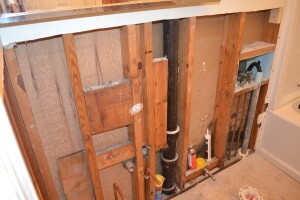 Bathroom renovation is a tough and I know how much time and money it need. You have done a beautiful. Before after is the perfect way to show people the difference. I appreciate what you have done to your bathroom. What you have done to your bathroom is beautiful. Can’t wait to use your tips at my house. Wow! What a transformation! The after looks great. I could definitely benefit from all of those built-in shelves! All I can say is WOW. What a dramatic transformation. You must be on cloud nine. So happy for you. And, Happy Blitz Day! Hope your day is blessed! 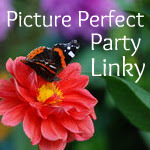 Tyrean Martinson recently posted…Jumble Party! 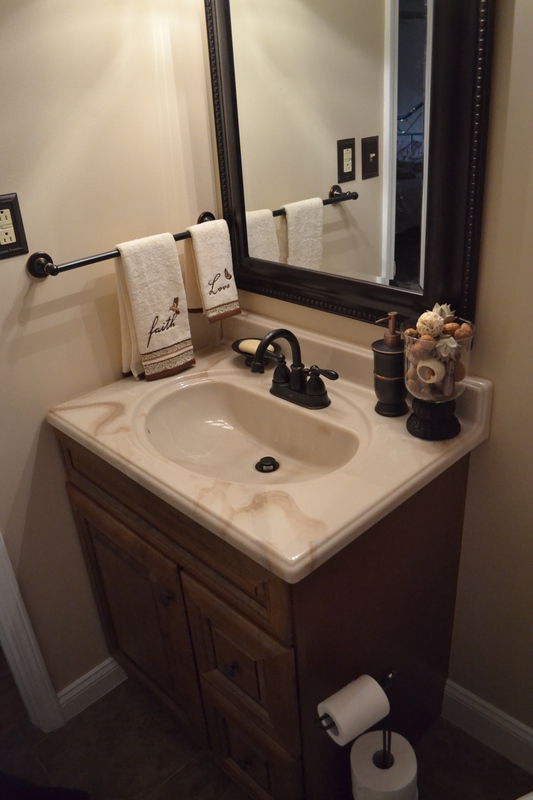 Congrats on a bathroom beautifully redone! It’s gorgeous. 🙂 I’m sure you worked your tail off. Oh, I bet this makes you feel so good to see everytime you walk into the bathroom! I love the brushed bronze fixtures. My bathroom is on the list. I need a walk in shower since no one uses the bathtub–I’ve always been a shower girl. I’ve been pricing them. The shower stall with a seat and railings, not bad, but getting a door to fit–Yikes. The rest is just cosmetics–new laminate flooring. Right now, looking at house renovation lists, new carpeting in the livingroom and laminate floors for the diningroom, kitchen, mud room have to come first. Bathroom? Maybe next year, lol! Nothing makes you feel better than a sparkling new room in your house. Especially a bathroom. It looks great! Very lovely job. And Happy Blitz Day!! Nice job renovating! I love the colors you chose! Nice job renovating! I love the colors you chose.m Happy Blitz Day! WAZOO! What a beautiful job. LOVE it. I’m redoing my office write now. It’s a job, but I can’t wait to finish it! Happy Blitz Day!! Awesome remodel job! Love the pics. Beautiful job on the bathroom! Happy blitz to you! 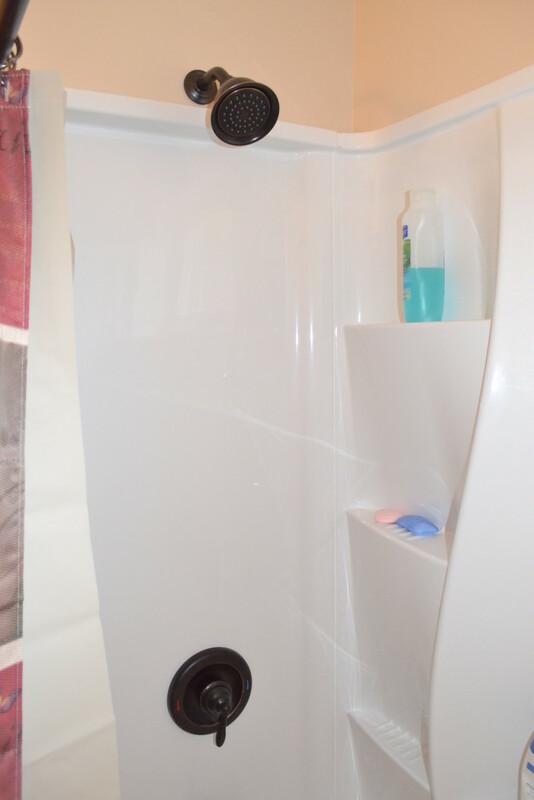 What a difference in the old and the new bathroom. 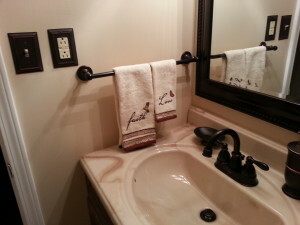 Lots of hard work but I like the finished project and your hand towels. Wow, it looks great! Congrats! I’m sure you’ll enjoy it. Happy blitz day! My wife and mother-in-law are undergoing the same project as I speak. I only hope our finished product looks half as nice as yours. Very well done! Congrats on the bathroom facelift! My guess is you either are or have been on well water and have had iron issues. Did you know that usually comes not from the water itself but from old plumbing? If you are on a well, it helps to jet the water out of the well rather than to pull it (pump it). Love the hand towel set! And that window! Wow! Enjoy your day of being Blitzed! So much better. I love the black accents. Love your new bathroom. I’m thinking of doing the same for my bathroom and you gave me ideas. Happy Blitz Day! I have a Pinterest board of other bathroom ideas. Thanks. Wow, night and day! Great job. 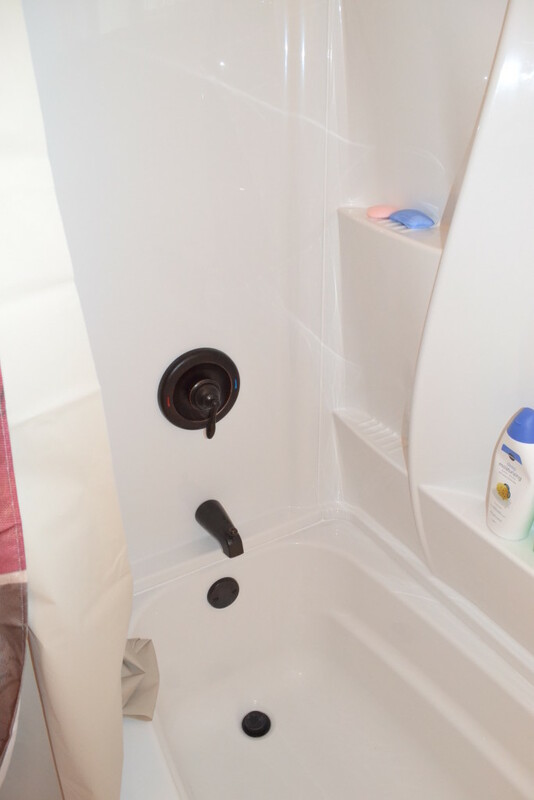 I like the tub you chose – lots of places to set things. Just dropping by to say Happy Blitz Day! Nice to meet you. Thought I’d drop by for the Blitz fun. If I’d been any earlier I might have had to help with the remodel. Nice job. 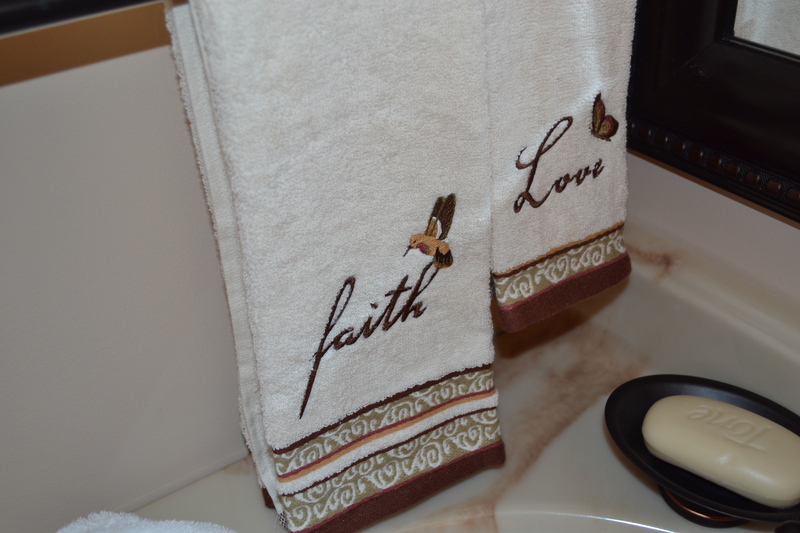 My wife would absolutely love those “Faith” and “Love” towels. 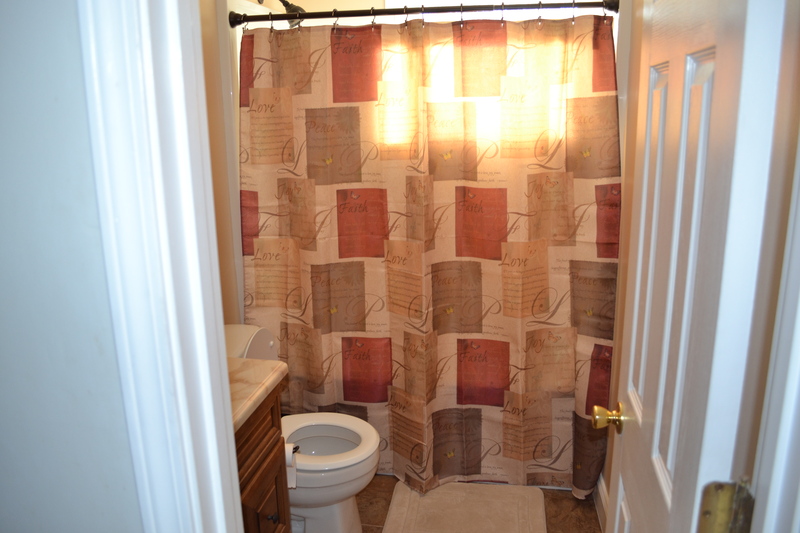 You really put in a lot of work on that bathroom! As a seashore-lover, I love the jar of seashells on the counter. Yay – I was one of them asking for “before” pictures! Awesome remodel! I’ve got two bathrooms that need an update. Feel free to come over and do mine! WOW! What a difference. Well done! Your new bathroom looks beautiful. You did a wonderful job! Wow! You did such an amazing job! Looks awesome! I love seeing the before and after shots! That’s incredible! The bathroom looks clean and inviting now and, I hate to say it, it didn’t before. Great post! I know it didn’t. 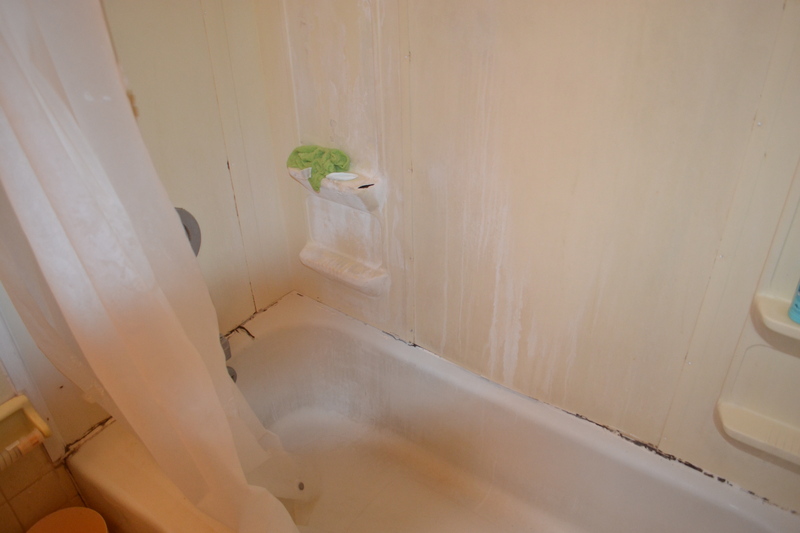 The bathroom was quickly remodeled in 1990s with a tub cover, but 20 years later that was old and the tub was leaking and causing mold problems. Thank goodness we were able to get it done now. Thanks for stopping by. Looks fabulous! 🙂 Your bathroom is very similar to ours in size and layout. We did a reno several years ago and it sure made a difference. Nice to meet you, Mary. 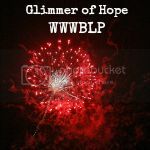 I found you through the Blog Blitz. HAPPY BLITZ DAY!! Oops! Looks like I jumped the gun and am a day early, Sorry about that!